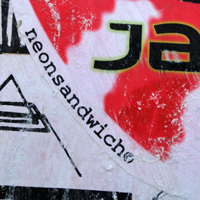 Location: Valencia @ 24th Street in San Francisco, CA Artist: Neon Sandwich. In our Interest or Yours? Location: Valencia @ 24th Street in San Francisco, Ca. Artist: Political Gridlock. Voxx Romana, Neon Sandwich, Skam. Location: Valencia @ 24th Street in San Francisco, Ca Artist: FTP. Voxx Romana. Skam Neon Sandwich. Photographer: Larry Jones.